Here at the Cosy Craft Club we send our subscribers a kit with everything they need to try a different craft each month. This month, it's a lino printing kit! I love how neatly everything is arranged. And I also love the little extras she’s included, such as a non-slip mat and spare lino for practising on. As you can see below, you also get a lino cutter plus two blades (1 x u-shaped, 1 x v-shaped), ink, a roller, 3 pieces of softcut lino, 10 pieces of simili paper to print on and a piece of tracing paper to transfer your design onto your lino with. And of course, a set of instructions! You can see them all being unpacked in this video. The first thing to do will be to choose the design you’d like to print. If you’ve got no idea, try searching for lino prints on Instagram or Pinterest to see what other people have done - but bear in mind that most of these will have been lino cutting for some time! Simple shapes and patterns are a good place to start, or you could carve an outline into the block for a ‘negative’ style print. I’ve created a lino printing Pinterest board for inspiration. There are two stages to lino printing: carving and printing. For the carving stage, use your cutters to cut away any areas of lino that you don’t want to print. A golden rule of lino printing is to always carve away from the hand holding the lino. I found it difficult to carve the curved shapes (straight lines are easier), but found it very rewarding to see the lino cut taking shape. The next stage is printing. The moment of truth! The one thing not included in the kit is something to roll your ink out on, but there are lots of things you can use for this. I used an old plastic plate, but you could also use a plastic board or a piece of toughened glass. It just needs to be flat, non-porous and wider than your roller. You need to roll the ink out until your roller is covered in a thin, smooth layer of ink. Roll it lightly over your lino cut until all the raised areas are covered. Place a piece of paper carefully onto the lino and press down firmly with the heel of your palm or a spoon over all the inked areas to ensure an even print (this is called burnishing). Lift the paper away and you have your first print! If there are areas that have been inked that you didn’t want to print, simply cut them away with your cutter and try again. You may need to experiment with the amount of ink and your burnishing technique to get a good print. Once you’re happy with your print, you can repeat it as many times as you like! My design was for a Mother’s Day card, which I repeated twice - once for my mum and once for my mother-in-law. 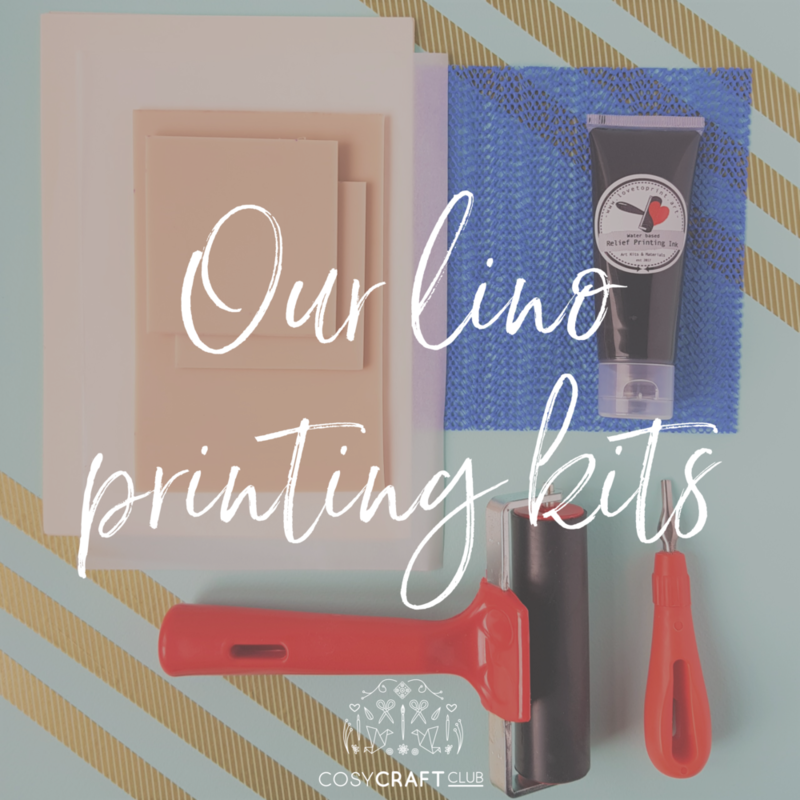 If you like the look of our lino printing kit and would like to have a go for yourself (or you know someone who would love to), these kits can be purchased from our Shop.